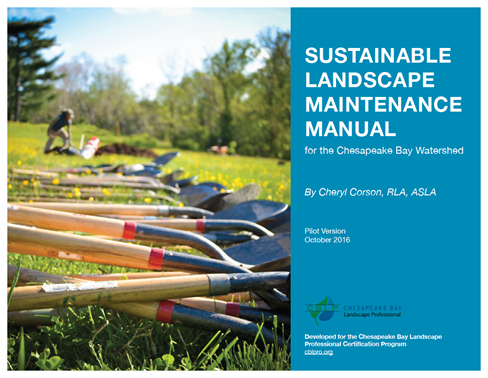 The CBLP maintenance manual is the first comprehensive resource on sustainable landscape management planning and techniques which is specific to the Chesapeake Bay region. Written for the landscape professional audience, the manual is a key reference for CBLP Level 1 training. It is available by free download, or for purchase in a full-color, laminated version. “What we are still developing is a maintenance infrastructure capable of caring for these landscapes. This manual has been undertaken to support those with boots on the ground in their efforts to manage and maintain green infrastructure now being put in place. “The Chesapeake Bay Landscape Professional (CBLP) certification program is an important regional step in connecting those involved at every stage in the process. It is dedicated to a paradigm shift toward greater collaboration between clients, designers at all levels, installers, and those entrusted with landscape care. Cheryl Corson is the recipient of a 2018 Merit Award from the American Society of Landscape Architects (ASLA) Potomac Chapter and the 2018 Garden Writers of America Silver Award for The Sustainable Landscape Maintenance Manual. The author and CBLP gratefully acknowledge funding provided by the District of Columbia Department of Energy and the Environment. Invaluable editorial and graphic design support was provided by Maryland Sea Grant College.